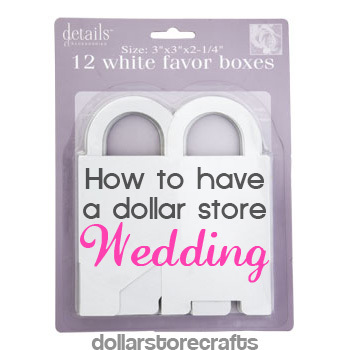 Yes, you can have a dollar store wedding that doesn’t look cheap or tacky. The wedding industry wants you to think you have to spend $30,000 on your wedding (or $10,000). This is a lie! You can have the wedding of your dreams, even on a shoestring budget. 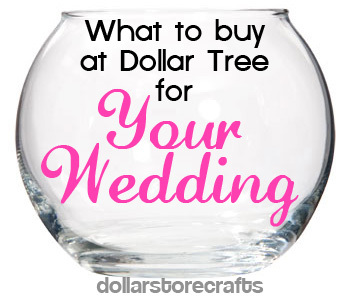 The Dollar Store wedding planner knows that with a little planning and some shopping around, she can have a wedding that looks expensive but won’t break the bank. You won’t get everything at the dollar store, of course, but you can save a lot of money by using dollar store supplies, and being smart! I’ve collected our best dollar store wedding planning tips here! We did a lot of my daughter’s wedding from the dollar store (Ours has a wedding section but not everything is $1 in that section.) We bought their wedding arch cost $35.00. I made silk floral arrangements for the arch peak, the arch sides at about waist height, and centerpieces for 20 tables…flowers cost me total maybe $100. We set the Collected (free) blue wine bottle center pieces on mirror squares from dollar store and my sister made us sea glass to put around the bottles on the mirror….again made out of FREE broken glass. We did her entire wedding including location, DJ, Catered food, her dress and 2 bridesmaid dresses, 3 tuxes, for $4000.00 We could have done it for less if it had really been necessary. for my wedding I bought all our candles at the dollar store and simply pinned ribbon to them. Wrapped black ribbon one time around wide white candle and tied a bow. If you find pretty pins, those can help hold the ribbon in place. They turned out very pretty, simple, and easy to do. I bought all my mirrors for my centerpieces at the Dollarama (Ottawa, ON). $2/mirror sure beat the $7 at Michael’s! Always remember to get bubble for the kids, you can never go wrong with bubble and you get great photo opportunitys. These tutorials are so awesome. Thanks Dollarstorecrafts for posting them!! You’re a huge inspiration for my insanely frugal crafting tutorials that I post on my blog. Keep on keepin’ it fun and frugal, guys!